Try not to fall out of your chair laughing. But if you do fall out of your chair... make sure to roll around on the floor while laughing. Stop, Drop, Laugh, and Roll. Or whatever that saying is. Ok well without further ado... Here's my short, sweet, funny little story of the evening! Tonight I came home after dark and forgot to leave a light on. A little earlier I had come home after work, made some dinner played some guitar and then decided to go for a good long evening jog by myself and listen to some iTunes U Stanford University Lectures on my iPod.... I'm currently looking for a good audiobook and I listen to iTunes U lectures in-between finding a good one... I think I mentioned before one time I listened to comedy while jogging... but, that's just a bad idea. People don't take to kindly to a person running down the street just laughing out loud to no one. I think you can make a mental picture of that. So yes, when I came home from my jog all exhausted I walked into a very dark apartment. Now, I must say, in the hallway they have these super bright florescent bulbs that make you feel like you are in one of those tanning bed things. So as soon as I enter the apartment it takes some time for my eyes to adjust to the light. Now, I figured since I've been doing the same "walking into my room turning on the light in the dark" motion for some time now, one would assume that this would not be a very difficult task for me to accomplish. I mean... let's see... ok, all I have to do is walk into my room along the wall to the corner, raise up my hand to the little twisty thing on the floor lamp... and then I just twist the little nob and the light bulb on the floor lamp pops right on! When you get an idea and the light bulb pops on over head. Well... sorta. ok not really... but how hard could it be to turn a light bulb on? This past weekend I decided to rearrange my bedroom because I got bored of how it was. I moved the bed around and pulled it out so instead of it being along side the wall just the head was touching the wall. I also decided to move the lamp across to the other side of the room by the closet instead of in the corner. And tonight, I forgot ALL about doing that. I entered my apartment from the "tanning booth" hallway and without thinking didn't bother to flip the little hallway light on and didn't bother to let my eyes adjust. I made a quick right into my bedroom, then I made a quick left and let my left hand just barely follow the wall and my right hand reaching up to find the light as I headed for the corner of the room. I took about 2 steps, and my right foot hit the corner of my bed. I toppled over the bed and slammed into the wall with my whole side of my body. I laid there in the dark for a minute or so thinking I might have broken something. Once I realized I was ok I just kinda laughed at the whole thing. Not taking any chances this time, I turned on the little flash light app on my iPhone and I got up and walked over... remembering there was a bed there now... and turned on the light next to the closet. I looked over at the window blind and was just very thankful that the blind was drawn and no one could see what had just happened. Anywho so that was rather embarrassing. I probably REALLY shouldn't post this up, but after it happened I really just thought it was pretty funny. Sometimes you just have to laugh at yourself. I don't know, life is just funny sometimes I suppose. I said... WHAT is WHAS??? Well, i'm glad you asked! 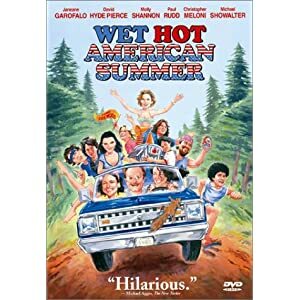 It's an acronym for Wet Hot American Summer. Or at least that's what I call it... WHAS... as in... WHASSSSS up homie? THIS... IS... my new favorite movie!! The movie actually came out 10 years ago, but for some reason I'd never heard of it until recently. I found it on netflix and watched the first half last night and the second half tonight. It's SOOOooooooo funny. No lie... also... it's even more funny if you have ever A) been a camper at a summer camp in Maine, or B) a counselor at a summer camp in Maine (been there, done that to both). Anywho I totally love this movie because there are just so many things about it that remind me of all that stuff that goes on at camp. The movie is a little over the top and a bit exaggerated. But it is definitely pretty hilarious and for now it's my new favorite movie. So go be a counselor at a summer camp... then go rent the movie and watch it. Of course, you can always just rent the movie and watch it, but I recommend being a counselor (or if you are young enough, a camper) before watching it. So... I've decided to make a Facebook fan page for computer fixings that I do. The name came from 1) obviously my last name being West... 2) my love of coming up with alternate names for my own name... and 3) the fact that I now live in Wayne, Pa. If you need any computer assistance and live relatively close to Wayne, Pa feel free to give me a shout out. The price model is a flat fee $100 per machine per incident. I'm rather fascinated with short stories. One of my favorite all time short stories is The Fall Of The House Of Usher by Edgar Allan Poe. This is way before the days of Usher the musician ever came on the scene. But I rather like this short story because it's what got me hooked on short stories. I remember reading this story in 6th grade and then actually going to see it performed live at a theater down town. I don't know what it is about it, there's just something odd, maybe it's the setting or just... well I don't know... but I liked it. I've read nearly all of Poe's material since then. He's a super interesting person. He's definitely most peculiar. I think if I could get the chance to go back and have a sit down and talk with him... I definitely would. That would probably be a very interesting conversation. So ever since then I've tried to write hundreds or maybe even thousands of short stories. I always end up getting about 2 or 3 pages in and then run out of steam. I don't know why I can't seem to finish one. I just sort of, well I just can't. So I've decided to try and write a short story AND finish it. I will post it when I do. I really want to try super hard to write and finish one. So we'll see. I was thinking about a thought that I had back in freshman year of college. I would get really annoyed come the weekend because all these people would run back to their hometowns to hang out with their highschool peeps... Now I was 5 hours away and had no car. So I wasn't about to run back to my hometown. Also I didn't really have a lot of friends in highschool anyways. I wasn't very popular or cool. But my whole point was... I was always like stop going back to the past and live in the here and now! Make new friends, make new memories... and they would always complain about how much they missed high school. I always felt like come the weekend everyone would just abandon me. Like everyone had run off to some big party and I wasn't invited. It didn't help that I didn't drink or do any of that big partying stuff so the people who did hang around always ran off to find the booze. So the lyrics are: The first time i'm thinking of the last time, the last time I'm thinking of the first time. I think probably one of the most useful abilities for an individual is the ability to quickly let people/things/places/old friends/social groups go. It's hard to let new good stuff come into your life when you are stuck on old stuff. I don't really have any care at all in the world for it... no attachment. I'll go home and maybe that next morning, or a week later I'll just wake up and have this feeling of missing whatever it is. This is kinda how starting to like someone or a thing is for me... each morning I wake up thinking about it more and more... I think that's sorta what falling in love is... Last thought at night, and first thought in the morning is of that person. and let anyone new come into my heart! Anything after that, I have no idea. But what I do know is there is absolutely no way to tell from first meeting someone who will stay in your life for a short time period and who will stay in your life for a long time. I know for sure that one of the people I knew the longest in my life who I met one night while she was waiting for a pizza delivery outside the dorm and I was just strumming my guitar... who would have known 8 years later we'd finally be saying our last goodbye. goodbyes are inevitable and unavoidable. So are goodnights... soooo on that note i'm off to sleep. Goodnight all! I'm always willing if you are. I don't know, I think that everyone is good and everyone deserves infinite amounts of chances. I'll never cut anyone out of my life and people can always talk to me! So... I just want to say that. yea that... it looks cool... also parking is free. I have one rule in life and one rule only... if parking is free... it's worth my time. I mean, hello... if monopoly taught me 1 thing during my childhood it's that free parking is the best thing there is. Soo just keep that in mind any time you go to an event or a place... if the parking is free.. it's probably the bees knees... if the parking costs money i'm soo dunny. 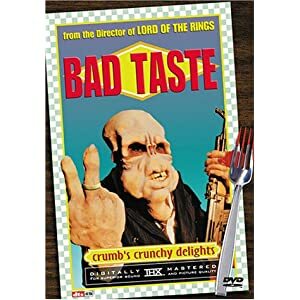 Except for maybe the movie bad taste... although it's one of those movies that is sooooo bad... it's good. So even that didn't leave a bad taste. One of the things I love to do and I consume a TON of it... is loose leaf teas steeped strong and then iced. Mmmm mmmmm Mmm it's soo good. I mean you can do traditional teas: greens, blacks, whites, etc. But you can also do herbals. If you do any of the berry teas it's almost like drinking Hawaiian punch... except there's nothing in it but taste and goodness in the way of natural antioxidantesk type things that are all good for you. Since it's a steeped leaf type thing there isn't actually any sugar or any calories at all in it. So I basically drink TONS of this stuff 3, 4, 5, 6 cups a day. It's awesome. Loose leaf teas are probably one of my favorite things on the planet. So that's my post on flavors. Really this is just a post asking if someone wants to go with me to flavor fest... so if anyone is bored and has nothing else to do that day... let me know! SO... I decided today that I REALLY REALLY REALLY... want to do the play Oliver! I don't care which character I am. I just want to find a nearby community theater that is putting on Oliver and do the play. It's totally one of my favorite plays... and also I kind of really want to be able to walk around saying "ello Gov'na"
I mean, because let's be honest... who doesn't love a good old cockney british-esk accent? until then... Consider yourself... one of us! "'Ye shall not make any cuttings in your flesh for the dead, nor print any marks upon you"
Basically to me it says... ok people... don't get tattoos. Now, I'm not saying anyone ELSE has to not get tattoos... if you like it and you are cool with it... do your thing. But I made up my mind a long time ago that I could never get one. It's just not going to happen ever. I would also never get a piercing. It's just not something I find enjoyable. to me it was like EEEEEKKKK!!!!! Don't DO THAT! I think that the body is beautiful the way it is naturally without any modifications. I think that the human body should be shown off as you naturally are. I actually am not really a fan of ANY body modifications... this goes for: tattoos, piercing, hair dies, make up, surgical modifications, etc. It's a slap in the face to the chef. Seriously, they will really be offended. and to go added all kinds of modifications to it as kind of like a slap in the face to the creator... just like it's s slap in the face to the chef who prepared the most perfect and delicious steak. I don't know... I just think people are beautiful just the way they are when they are born. But if you want to do all that stuffs do it up... this is just the way that I feel about my own body and why I don't do any of the tat's or piercings or hair dies or any of that stuffs. So now everyone knows why I don't like tattoos. But I do love me that Leviticus 19:28 verse. I was like: BRING it Friday the 13th! And Friday the 13th was all like... I got nothing. And I was like That's what I thought... homes. And here we are now. So today has been a pretty fantastic day. I hope everyone else made it through ok!